Ghoul At School! 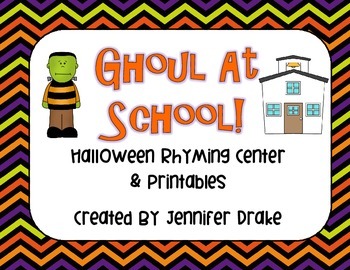 Halloween Rhyming Center PLUS Printables! There's a ghoul at school...don't say 'BOO!' He is busy looking for you! This Halloween themed pack will help your little 'ghouls' stay focused as they practice rhyming...while tapping into their excitement about Halloween! Little prep is required to get this activity up and running! 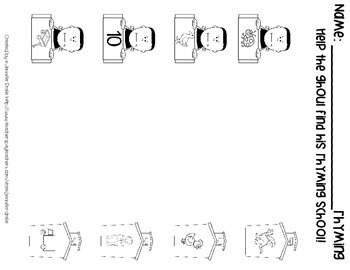 Print, laminate, cut, play! 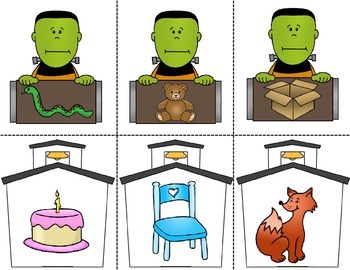 *Use as a Halloween Station activity! Looking for more rhyming fun? Visit my TpT Store and click on the 'Phonics/PA (Non Seasonal)' tab! Be sure to check out my 'Halloween fun' too! Consider becoming a follower to receive email notification of product and freebie uploads! 'Like' me on Facebook for exclusive fan freebies, giveaways, games & more! The possibilities are endless with this pack! Your kids will be having so much fun they will have no idea they are working on phonemic awareness skills! 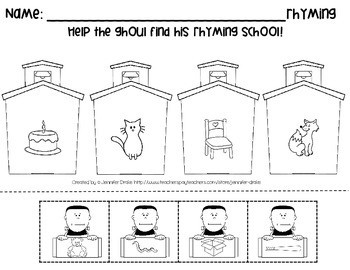 Happy Ghoul in School Rhyming Fun!